This time of year can be so crazy and busy with all of the things that are going on. There are school performances, work parties, church parties, parties with family and friends, presents to buy and wrap, and so much more. We have had most of our Christmas shopping done for a few weeks, all we had left to do was stocking stuffers and we are finally done with that too. We have had Christmas parties every weekend this month and on top of all of that we have had a nasty cold making its way through our family. 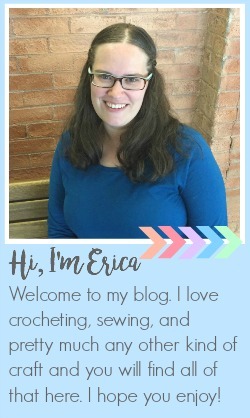 As a result it is taking me so much longer than I planned to get posts up on my blog, I have had this post and another almost ready to go for quite a while but having extra kids home from school makes it so much harder to get stuff done. Now it is almost Christmas, which I can't, believe and I am running out of time. Each of our family parties has traditions that we do at each one. I already shared some of the ornaments that I made for the ornament exchange that we do with my family. My husband's mom always has a Santa party where Santa comes and gives each of the kids a gift. The only party that we still have left to go to is the end of this week and one of our traditions at this family party is Christmas Bags for the kids. 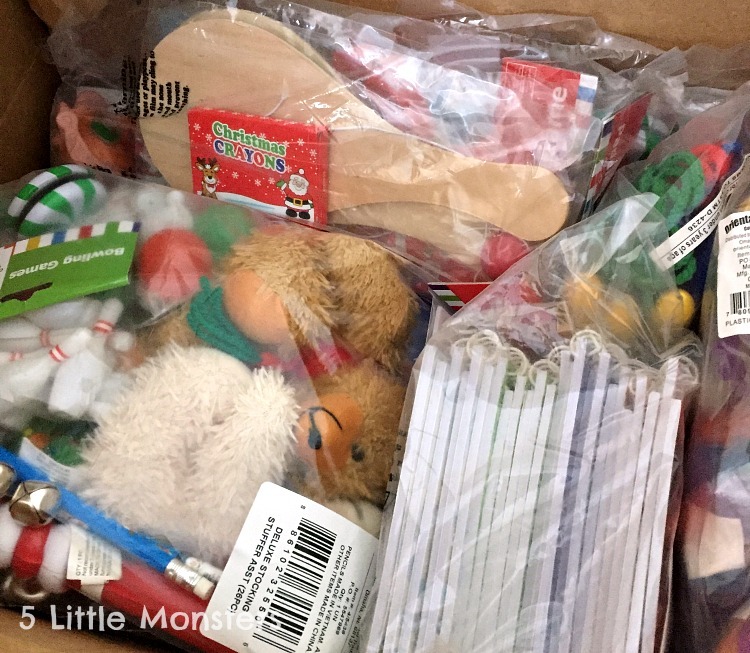 What we do is we fill bags with small, inexpensive, stocking stuffer type toys for the kids to open. 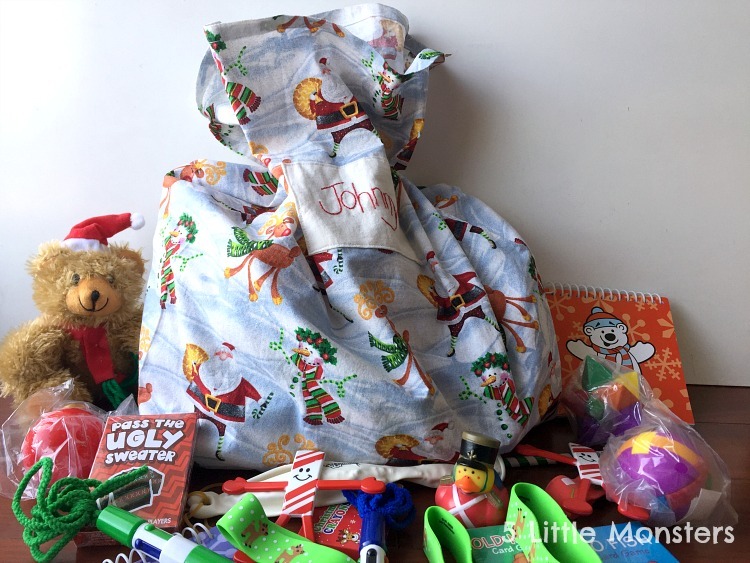 We bring a bag and presents for each child and the dads and grandpas all go in another room to fill them up and then they bring them back in and pass them out to the kids. 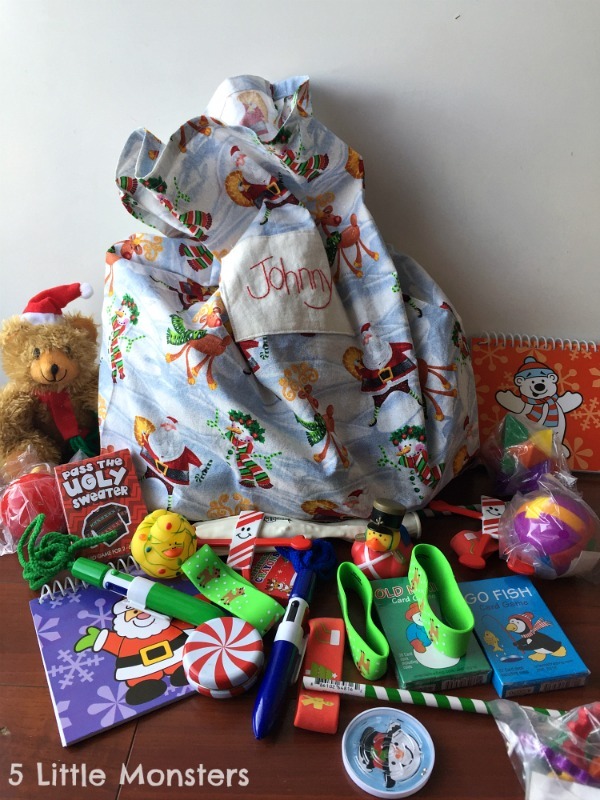 The bags that they use are sort of a pillowcase style bag made of Christmas fabric. When we were first married and the first few years that we had kids they had a few bags that someone had made years before for all of the cousins. But as the family grew there were never enough bags to go around and every year some kids ended up with plastic grocery sacks full of toys. A few years ago I decided I was going to do something about that problem. At the time we were expecting our 3rd baby and my sister-in-law had 2 kids so there were a total of 5 grandkids (or soon to be) in my husband's dad's family, we do the family with aunts and uncles too so there were more than that but that was our family's portion. I decided to make bags for those kids, hoping to offset the shortage of bags. 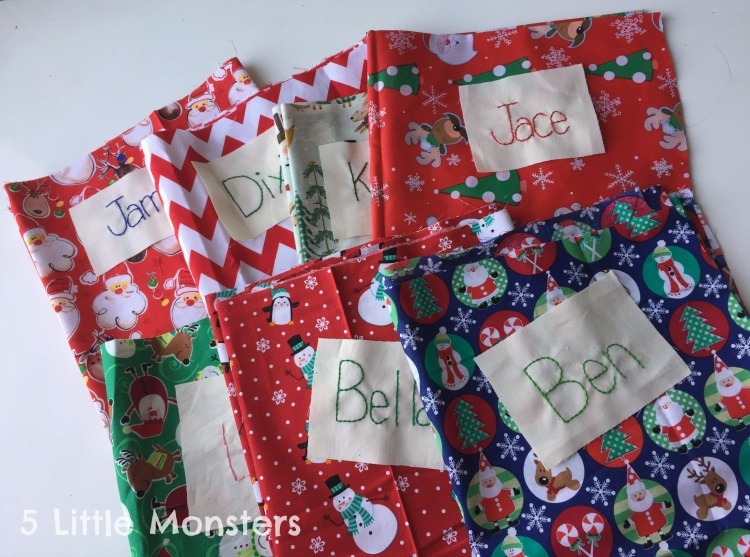 I thought it would be fun to make them all different and add their names so that every year they would use the same bag, kind of like a stocking. Now I make them for each of the new babies in the family and the parents just bring their kid's bags so we always have one for everyone. Over the last couple of years there have been lots of new babies in the family (and we misplaced one of our bags and needed to replace it) so I had a lot of new bags to make this year. To fill the bags we usually hit up the dollar store or the dollar section at Target to pick up a bunch of small toys for the kids. It isn't usually anything big or expensive, just little stuff to keep them entertained during the party. We also pick up some candy to put in the bags. 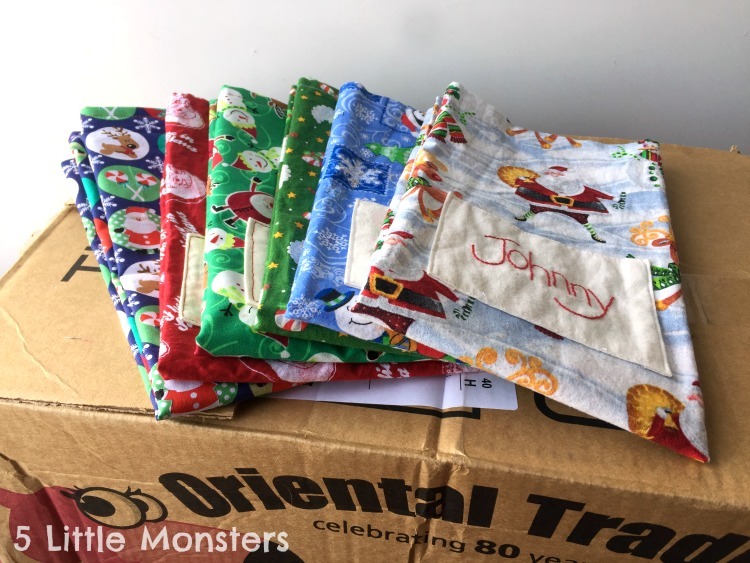 This year instead of buying a bunch of dollar stuff I decided to partner with Oriental Trading Company and they sent me a bunch of stuff to use to fill up the kids bags. I got 2 of their stocking stuffer assortments, the regular set and the deluxe assortment. Just those two things gave us quite a variety of small toys to divide between the kids but we picked out a couple other things too. My kids love drawing so we got some holiday notepads and mini shuttle pens. We also got puzzle balls and splat balls, which I think the kids will have a lot of fun with. I divided all of those things between the kids and still have some leftovers that we can either use for something else or save for next year. After all of the bags are passed out and presents are opened the adults have a gift exchange. Usually the kids just play with their new stuff but the group is getting so big that it can go on for a while and sometimes the kids need a little more to keep them busy so while I was picking out bag stuff I also picked up some activities for the kids. 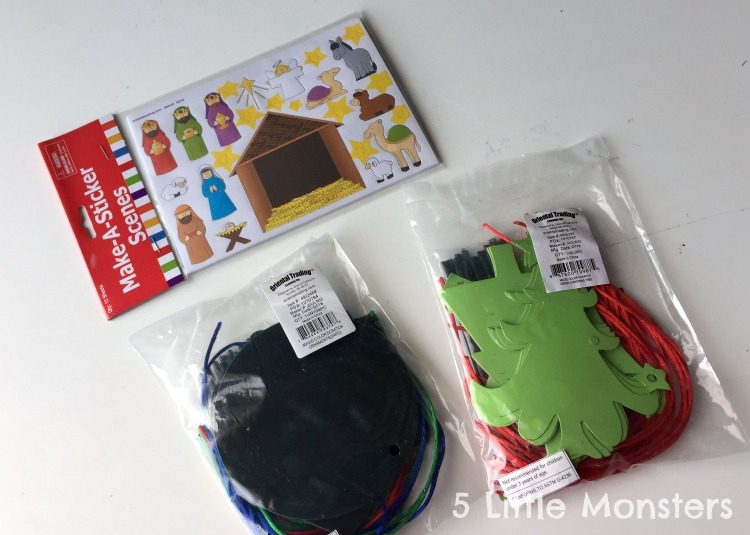 I got some nativity stickers so the kids could make their own little nativity scenes and I also got Magic Scratch Christmas Trees and Ornaments. I thought those would be things that were easy enough that they could do them without much help, plus there were quite a few in the packages so there would be enough to go around. 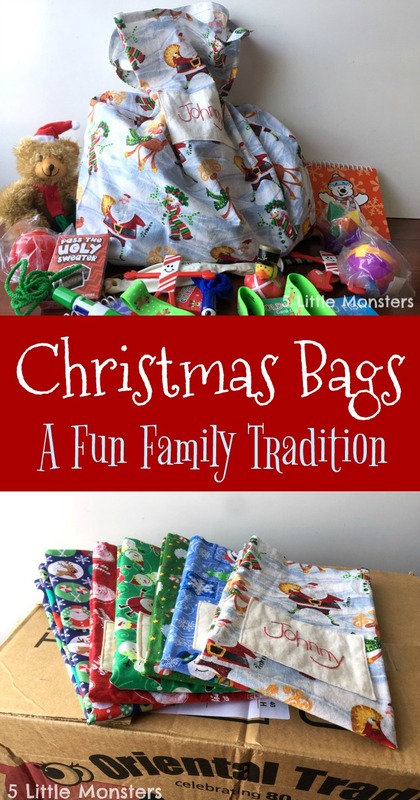 The Christmas bags are really easy to make and a fun tradition for family parties, or you could even use them for easy gift wrapping. If your print is multi-directional the bags are super easy to make. Take your 1/2 yard of fabric, fold it along the fold so that the right sides are together and sew up each side. I usually don't even trim the selvedge edge off, I just fold it in and hem around the top. If your fabric pattern is one direction than you need to cut a piece that is about the same size as 1/2 yard when folded, or about 18" x 22". I usually cut it on the fold so that I only need to sew the bottom and one side. Whichever way you cut your fabric, you will sew the sides so that only the top is left open. Fold the top edge under a couple of times, about 1/2", and hem. Make your name piece by writing the name in pencil or washable fabric markers a piece of muslin, leaving at least 1" all the way around the name. Embroider the name, I used 3 strand of embroidery floss and the backstitch. Trim the piece so that you have about 1" or just a little less all the way around the name. Pin the muslin in place on the front of the bag, being sure to only go through the front layer. Then fold the edges in and stitch around the outside of the muslin rectangle. The bags themselves take only minutes to sew, the longest part is embroidering the names and even that doesn't take long and you have something that you can use year after year as part of a fun family tradition.